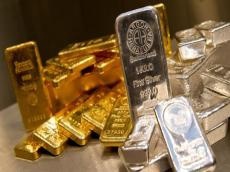 Prices for gold, silver and platinum decreased, while the palladium prices increased in Azerbaijan Oct. 4, according to the data published by the country’s Central Bank. The price of gold decreased by 16.065 manats to 2,033.88 manats per ounce in the country on Oct. 4, compared to the price on Oct. 3. The price of silver decreased by 0.3139 manats to 24.7977 manats per ounce. The price of platinum decreased by 20.119 manats to 1,394.5360 manats. Meanwhile, the price of palladium increased by 0.901 manats to 1,798.4895 manats in the country.